One of the “benefits” of not having a job is that I am able to watch things on TV that I might not otherwise see. A week ago I got to watch two girls wrestle in bar-b-que sauce for their man’s love on Jerry Springer. Turtleman: Ye ye ye ye ye ye ye ye ye yeee!! That's some live action right there!! 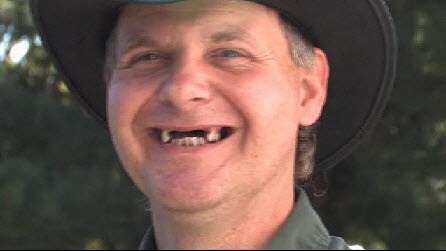 I also have been turned on to the Turtleman from Animal Planet’s Call of the Wildman. I can’t stop repeating one of his catch-phrases as I walk around the house and have decided that I’m going dressed as Turtleman for Halloween. I’ve even watched a few episodes of The Lottery Changed My Life on TLC. Other than the Turtleman, none of the shows I’ve watched have had much of an affect on my life… until today. That’s when I stumbled on an Extreme Couponing marathon on TLC and possibly a way to beat my Wal-Mart demons. I’ve heard of extreme couponing before but had never seen it in (live) action until today. I watched the first episode and couldn’t believe what I was seeing. People were racking up massive grocery bills and cutting them down by 75-95%. My mind was racing with possibilities as I thought about how awesome it would be if I could do what they were doing. Before the second episode came on I was already online trying to find ways to start being “extreme” with my coupons. I usually take coupons with me when I shop and often try to use them as my defense when Tammy gets upset at how much money I spent. I think the most I ever saved was prolly $20-25 but these people were saving hundreds of dollars, literally, with coupons. There were even a couple of people who bought over a thousand dollars worth of food but walked out of the store paying less than $50. There were even people who were MAKING money on some of the items they “bought.” One lady said she “saved” her family over $60,000 in a year. I was so excited when I heard that part that I sent Tammy a message. Me: This one lady saved her family over $60,000 a year by couponing. If I could do that I’d never have to go back to work!! I learned that people were using a lot more coupons than what we get in the Sunday paper. Although some people were getting extra Sunday papers so they would have multiple coupons. Some people were spending 30+ hours a week cutting and organizing their coupons in giant binders. They had checklists and spreadsheets to help them figure out what the best deals were and where they needed to go to get them. But as much as I wanted to get into this thing, I couldn’t wrap my head around why people were buying SO MANY items. That’s MY kind of pantry! One lady bought 20 bottles of hot sauce, another bought more than 30 bottles of BBQ sauce and there was one who bought over 300 boxes of noodles. One family even bought 50+ boxes of couscous even though they had never tried it before. One lady even had over 130 bottles of Sun Drop because it was her niece’s favorite drink. Then there was the couple that bought 540 cups of yogurt and the one that bought every bag of croutons off the shelf. I guess they had a coupon for every item, but I don’t understand why they have to use them ALL during one visit. Couldn’t they just buy 5 items and still save money? These people had stockpiles of food that would make the Doomsday Preppers jealous. 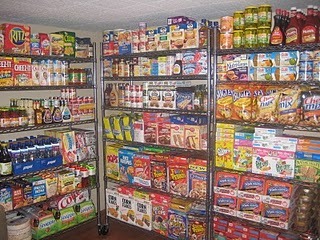 One family had so much food that it was shelved in every room of the house… EVERY ROOM. Some people had so much stuff that family members would “shop” at their house. I was so fired up from watching the show that I started cutting the coupons from Sunday’s paper and signed up at a few couponing sites. When Tammy got home I started telling her about some of the stuff I learned as well as the stuff I didn’t understand. But she blew up when I told her how one family donated over $100,000 worth of food to the local food bank. Tammy: What’s the f’n point in saving money if you’re just giving it away? Me: They still saved the money. They were just giving it to charity. Me: Can they write it off on their taxes? She’s such a loving, caring person. Really, she is. I thought maybe she’d get into it if she watched a couple of the episodes I recorded. We started the first episode and it didn’t take long for it to get on her nerves. Tammy: They bought 20 things of cheese? That’s stupid. Sometimes we buy 3 things of cheese and it goes bad. Me: I know but just keep watching. I’d love to come home with that much food because I know you’d flip out when I told you I spent $500 then be so happy that I only had to pay $40 because of coupons. I didn’t get a response. Well, unless you count her glaring at me. It didn’t help that rumors were flying around that the Colts might release Peyton Manning, the man Tammy might love more than me, and my making her watch stuff was causing her to miss any updates. Tammy: OK, I’m getting a little peeved. Tammy: Because I don’t wanna watch this crap. I don’t care about extreme couponing. I’m not gonna ever do it. We made it through the rest of the episode and I was explaining all of the stuff I was gonna do to get my couponing on. Tammy: I wanna quit my job so I can stay home and watch you being stupid. Any extreme (or not-so-extreme) couponers out there? Have any tips for me? Do I have to buy massive quantities to be successful? What has been your biggest couponing success? Gallery | This entry was posted in Daily Life and tagged daily life, extreme couponing, humor, shopping, turtleman. Bookmark the permalink. 8 Responses to Extreme Couponing: My New Hobby? You should talk to Judy. 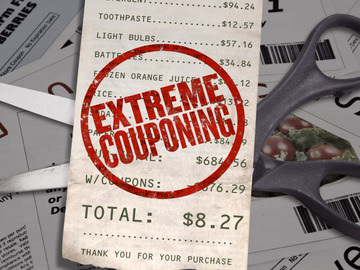 Extreme Couponing is really easy, and it doesn’t take as long as the people on the shows take. Browsing a few blogs every night usually does the trick. It does take a while to plan your trip and find out where the best deals are, but it is worth it. You do not have to stockpile like the families on the show if you don’t have a need for it. Most couponers are considerate and prefer not to clear the shelves, it is just polite. The max on printable coupons per computer is usually 2, so unless you have many many computers you’re not going to get any more than that. Newspaper inserts, you can buy as many as you want, if you have a need. The coupons and deals always come out early – before the next week – so you can plan your trip the week before and then hit the stores Sunday morning if you want to make sure the shelves aren’t empty. You should only feel the need to stockpile if you are going to use the item (although some prefer to donate as well). For instance if you don’t eat yogurt, don’t buy any just because you can get it for .07 cents or even free. I bought 8 toothbrushes the other day because I got them for free and I know that I will always need them! This way I can forget about clipping toothbrush coupons for a while! Haha, wish you the best if you go for it! It’s fun! I know someone who does it, sometimes drives an hour away (how much must she spend on gas? ), and has so much toilet paper in her house that it is smooshed into every closet and room. Sounds crazy to me, but I want to hear all of your escapades if you try it. The best I can do is manage to get a coupon lined up with a sale. I just don’t buy many products that have coupons so it doesn’t benefit me. I finally got a new computer and I can respond to this! So excited!!! Okay….first go to southernsavers.com (even if you don’t live in the south.) It gives great tips and also links to weekly coupons you can print from your computer. Second, if you have a Harris Teeter near you, link on to E coupons and check them out every week. Third, make a binder, use baseball card holders to hold your coupons. It will be super organized. Make the categories of each section of your binder each row of the grocery store. Also a helpful hint…stores like Target let you match up coupons so you can have a target coupon and a manufacturer coupon for the same item and use both. I tried couponing, but I eat mostly organic so there weren’t many coupons for my stuff. Let me know how it works for you! it over the sound of my computes fans. Some suggestions for this during the treatment time include:.